Braille wasn't widely in use in the 1830s, but Samuel Gridley Howe, founder and president of the New England Institute for the Education of the Blind, wanted to develop an atlas that his students could read unaided by a seeing person. 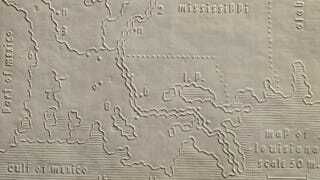 To that end, he created a specially embossed atlas that could be read by touch. With the aid of John C. Cray and Samuel P. Ruggles, Howe developed the map using new embossing methods that he believed would be superior to earlier relief maps. Fifty copies of the atlas, perhaps the first of its kind, were printed, each containing 24 state maps plus explanatory text in raised (but non-Braille) letters. Only five copies remain, but fortunately the entire thing has been digitized by the David Rumsey Map Collection.